Every company (and probably every sales person within a company) has different routes through their sales processes and methods. Good thing this article isn't one of those, right? Below we will outline some great practices when dealing with sales pipelines. No promises that they are the best or guarantees you'll be winning after, but some honest tips we find have proven to work. PRO TIP: Moving customers through the sales pipeline can become tough to manage. Using a CRM software can help your sales team be a more productive and efficient machine. A sale pipeline is a visual approach that shows the process that both a sale prospect and sale rep must go through to be turned into a customer and meet quota. The pipeline (similar, but different than a sales funnel) shows actual actions that must be done to meet those goals and outlines which deal may need more attention and how well the entire sales team is doing as a whole. Why are there so many tips and tricks and opinions about the best way to construct a sales pipeline? Think of it a bit like writing a screenplay for a movie. There are certain formulas that people tend to subscribe to when it comes to making a movie. For example: guy meets girl, they get in a fight, they get back together, and live happily ever after. Another example: someone is somehow super, bad guy is introduced, bad guy proceeds to defeat our hero, hero somehow builds themselves back up again, and hero is victorious in a final battle. When you’re writing a screenplay, even though the plot points might be different for each film, the same general arc can be glimpsed time and time again. It’s the same for building your sales pipeline. There is a plot arc most companies will probably follow, even though the steps and details will be company (and maybe even product) specific. 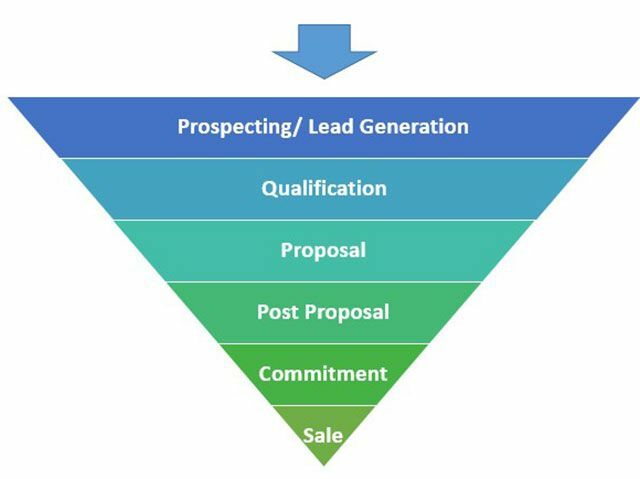 So, enough waffling, let’s take a look at the four components that make up the arc of most sales pipelines. This is akin to that moment the two leads in a RomCom meet each other. It's when a prospective client walks into your life, and you just can’t look away. Nor should you! This is the stage in your sales pipeline where your prospect is getting to know you, figuring out if your company is trustworthy, and whether you are offering what they need. For some companies, this stage is done entirely by the prospect, others use widgets and web apps, more will hire a different firm, and not to forget the ones that will take care of it in house. The important thing to remember about this stage is that you are looking to build a relationship – one built on trust – that will provide a foundation going forward. So, if you say you’re going to call them tomorrow, make sure you call them tomorrow. If you tell them your product will do something, be sure that it does. This is the stage that is the easiest to neglect or try to rush through, but if you provide the right information at the right time and use that to build the foundations of a good relationship, it will make every other stage that much easier. In your average big budget action or superhero movie, this stage will start with our hero being defeated and having to build himself or herself back up again. This is where we learn about their weaknesses, as well as see their redemption. When it comes to a sales pipeline, this is the moment where you and your prospect lay your cards on the table. You find out how much they’re willing to spend, what they want for that price, any sales objections they may have, and how stubborn they’re going to be about getting it. They find out your prices, terms, and how flexible you can be on both of those things. It’s a back and forth. Not so much a test of wills as a learning curve, finding out where either side can make accommodations and which points are deal-breakers. I’m making this sound very combative, but it doesn’t have to be. Don’t forget, you aren’t fighting your prospect, you’re fighting your competition. Just like in the last stage, where you were building trust and laying the foundations of a relationship, this is finding out if that relationship is enough to stand the rigors of the final battle. Now it’s time for the big moment. Time to hold a boombox over your head to win someone’s heart. Actually, that’s not quite right. It’s really the moment you'll find out if all the hard work you’ve put in has paid off. It’s time to see if you won the business and if that relationship and the tests you put it through were enough to see off your competitors. At this point, the haggling is done, and there isn’t anything more you can do to win the business. This is about going in for that final conference, signing the papers, and delivering on your agreement. PRO TIP: Leverage a sales enablement software to help your team crush sales goals. This is usually the end of the sales pipeline, but where you draw the actual line in the sand is up to you. Some will take the signing as the end, while others will see the money in the bank as the conclusion. I can tell you, though, that your customer won’t draw the line until they have the service or product they’ve purchased, and neither should you. Once you’ve closed the deal, you (like some movie franchises) should have another stage in your relationship with your (now) customer. A stage devoted to ongoing customer care, designed to ensure future purchases. Regardless of whether this is a formal part of your sales team’s job or it goes to another team, remember that your customer will use any after care to define their relationship with you and your company. So, now it’s time to actually write your own screenplay (sales pipeline). As mentioned before, everyone’s sales pipeline will be slightly different. Some will have a long nurturing time, but short negotiation stage. Others will be the exact opposite. How do people find out about us? What do they want to know in this early stage? Who else are they looking at? What kind of relationship do I want my sales team to build with new clients? What do we need to know about them to provide the answers they need? How flexible can I be on price? And the terms? How do I know what they want? What supporting information will I need to provide? What can I do to make this process as smooth as possible? Where does “sales” end and “finance” begin? What needs to happen immediately after the sale is closed? How does the handover to the next team work? How do I ensure the client gets what they paid for? Who has the responsibility for ongoing account management? How am I going to measure whether the customer is happy? Do I have a plan for following up lost opportunities? Now that you have an idea of what your sales pipeline should look like, and you have answers to some of the questions above, it’s time to go into detail around your company and products. Once you have those details, formulate your pipeline. Building this pipeline will give you and your sales team a clear process for moving your prospects from when they find out about you all the way to completing the sale. Once you have a draft, I would always recommend that you present it to select members of your sales team (or all of them) so they can give “on the ground” opinions on it. After all, they’ll be the ones using this framework on a daily basis. It also gives them a sense of ownership around the whole process. If they feel like they’ve contributed to how the process works and why certain things happen when they do, they’re much more likely to stick to it and follow it for their own sales. Ready for your company to become a sales machine? Learn how a free CRM software can help your small business crush customer relationships and new deals in 2019. Before I got my start in the tech industry as part of Apple's UK Mac launch team, I was a professional drummer (notice I didn’t say musician). But once I got in, I was hooked and I’ve been involved in the tech industry, primarily software development, for over 20 years. I founded OpenCRM in 2005 and I now have the enviable title of System Architect (as well as Managing Director).